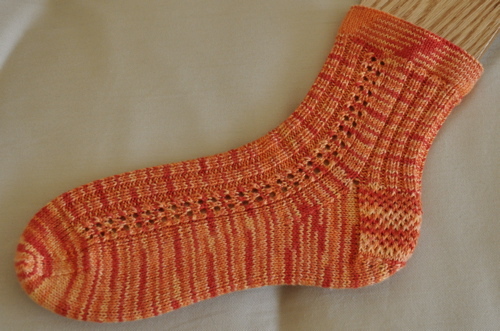 I started these in March, whipped out one sock and got bored. It languished on my desk until I had time off for surgery, when I picked it up and slowly worked on it. Turns out "slow" finishes things faster than "not at all", and you can knit lace while on controlled substances if you go slow enough. These are for Lara, and they should have reached her by now. They’re bright and cheerful and cool enough for Nashville warmth. I started with a hemmed top, put in panels of double eyelet rib, an Eye of Partridge heel flap and a grafted toe. I know they’ll fit because we have the same size feet. I finally got a sock blocker. Just the one. This is the first picture with it. They are cheerful! And they look very cozy…what a great gift! That sock is freaking gorgeous. You’ll have to show me more of the socks you’ve made. I also need to RSS your blog. 🙂 But, that last sentence was extraneous information.